Community events and activities for the weekend of July 22-24. Got an event we didn’t know about? Please add it in the comments! Just when you thought it was safe to go back in the water. Tickets $5. More info here. Mobile food, live local music, and lawn games — now at a new location. Continues every Friday through October 21. More info here. Weekly get-together featuring music, popcorn, ice cream, and beer, this week featuring a rotating crew of deejays; this week featuring DJ’s Nik! and OZE.” More info and prices here. Comedy featuring Joe Klocek. Admission $10, $8 for students, seniors and peace officers. More info here. A weekly free dance lesson followed by an outdoor dance party. More info here. See our coverage of the recent waltz lesson night here. To celebrate the 10th anniversary of their label and the 3rd anniversary of their Oakland storefront, the 1-2-3-4-Go! Records folks are putting on three days of music at the Oakland Metro Operahouse, all hosted by Blag Dahlia of the Dwarves. Shows run July 22-24. More info, band lineups and ticket prices here. Jazz music with Ron Crotty on bass and Terry Rodreguez on piano, happy hour on beverages and small plate food specials at the museum’s Blue Oak Cafe. Museum ticket not required. More info here. More info and ticket prices here. Roots rock and blues. More info here. Soul music. $5 admission. More info here. $7 admission. More info here. The contemporary jazz pianist begins a series of four shows. More info here on showtimes and ticket prices. Indie/alternative rock. No cover. More info here. Reggae and hip hop with DJs rocker-T, Smoke 0ne and Irie Dole. Admission $10. More info here. Bike or vanpool on a tour through the gardens and historical spots of West Oakland, beginning and ending with edible schoolyard gardens created through the OBUGS (Oakland-Based Urban Gardens) program. The fundraiser includes food from Picante and live entertainment from the Turf Fienz; you can also borrow a bike and helmet if you don’t have one. More info and ticket prices here. You can see Oakland North’s previous coverage of the OBUGS program here. Join Bikes 4 Life in ride to promote non-violence. Ride begins at the lake and ends at the group’s West Oakland bike shop, to be followed by a movie festival. More info here. At this benefit for the St. Vincent de Paul Kitchen of Champions culinary training program, local chefs will square off against each other in 15-minute battles. More info and ticket prices here. You can read Oakland North’s previous coverage of the Kitchen of Champions program here. Featuring Kem, Boney James, Will Downing, Lalah Hathaway and more. More info and ticket prices here. Fenton’s Creamery and Peets Coffee & Tea help the Chabot team teach visitors about the science of food. Free with museum admission. More info here. A talk by bee expert Celeste Ets-Holkin. More info here. Gil Stancourt teaches you how to make your own lamp. $20 for the class plus $20 for materials fees. More info here. Poet Rachel McGee Beck leads a workshop in overcoming writer’s block. More info here. An all-ages puppet presentation of “The Three Billy Goats Gruff.” More info here. An exhibit by two painters whose work is heavily influenced by travel. Show continues through August 21. More info here. A quieter, more art-focused weekly stroll highlighting the artwork in the galleries of the Uptown District. Click here for more information about participating galleries and the geographic area covered by the Saturday Stroll. Comedy featuring Anthony Hill. Admission $10, $8 for students, seniors and peace officers. More info here. With special guest Amp Fiddler. More info and ticket prices here. Blues, R&B and soul. More info here. $5 admission. More info here. Cleve-Land, Edge City Ruins and many more. More info here. Alternative/indie rock. No cover. More info here. Classic hip-hip and neo-soul with JAMO and DJ BLACK. Admission $5 before 11 pm, $10 after. More info here. Free show for all ages featuring Princess Mimi and Gouda Black. More info here. Oakland Heritage Alliance presents a walking tour led by Kathleen DiGiovanni of Children’s Fairyland, the Lakeside Garden Center and the Lawn Bowling Club. More info on tour and donation amouts here. Bring clean clothing, accessories and shoes in usable condition, and swap away. More info here. Peggy Simmons leads a writing workshop for writers of all experience levels and genres, ages 16 and up. $1-$25 sliding scale fee. More info here. Conductor Troy Davis leads the band in a selection of traditional, pop and show tunes. More info here. Featured artist the Bill Bell Trio performs, plus Randy Moore lectures on the history of jazz, followed by an open jam session. More info here. Richard Thomas, Feona Lee Jones and soprano Maria Mikheyenko perform Sergei Rachmaninoff’s Piano Concerto No. 3 in D minor, Op. 30, also known as “the Rach 3,” and other classical pieces. More info and ticket prices here. Read our previous coverage of Musically Minded Academy here. 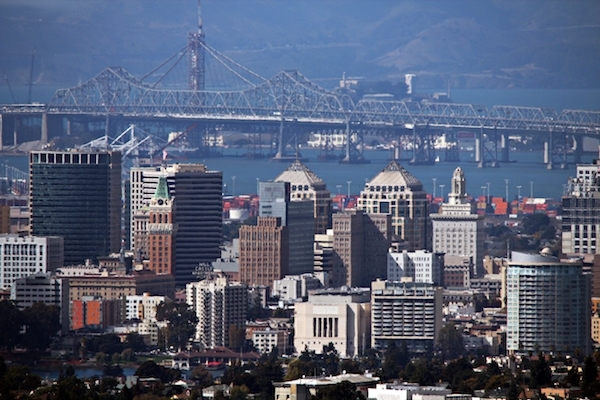 Free 90-minute walking tours through Oakland’s downtown, offered May through October. Reservations recommended. For more information, including details of the 8 itineraries available, click here. Benefiting the animals of Harvest Home Animal Sanctuary! Delicious home-made vegan baked goods and cinnamon rolls from Cinnaholic and pastries from The Breakroom!